Right as he sat down at the brunch to thank first responders for their service last week, Clackamas firefighter Kerry Owen's crew was called out of the Oregon City Christian Church on an alarm at a local elementary school. Owen was able to return about 15 minutes later after reminding students against pulling a fire alarm when there isn't an actual fire. As he sat down to eat his now-cold eggs, he said he didn't mind eating food at room temperature and had become used to it. The Sept. 11 incident highlighted the everyday sacrifices that first responders go through in order to serve the community, putting themselves in daily danger and discomfort even if they never have to make the ultimate sacrifice. 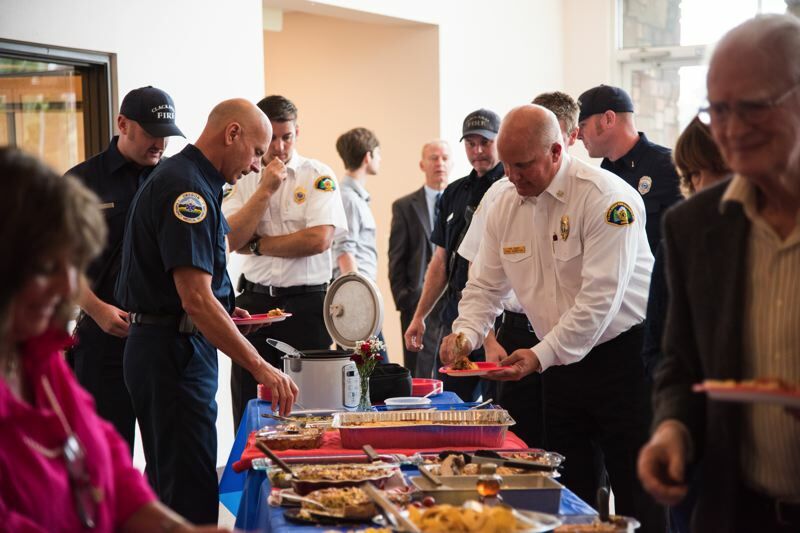 In addition to the now third-annual event at OC Christian Church for about 100 local first responders, the Patriot Day Remembrance at Red Soils in Oregon City celebrated its second anniversary last week. U.S. flags across the country are flown at half-staff to honor Patriot Day, which President George W. Bush signed into law as an annual remembrance of those who were injured or died on Sept. 11, 2001. In 2009 President Obama expanded the commemoration to recognize it as a National Day of Service and Remembrance. 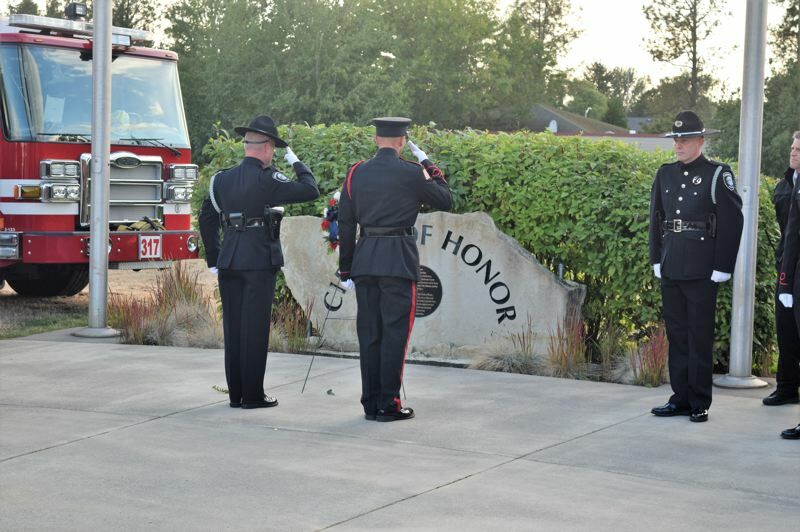 In Oregon City last week, National Day of Service and Remembrance events paid special tribute to local firefighters. Clackamas County's Red Soils event called out the Happy Valley firefighters who have won international awards this year for their heroism in saving a woman from a house fire last year. Clackamas Fire was among the many agencies that sent firefighters to last summer's Eagle Creek fire and managed to save the historic Multnomah Falls Lodge. 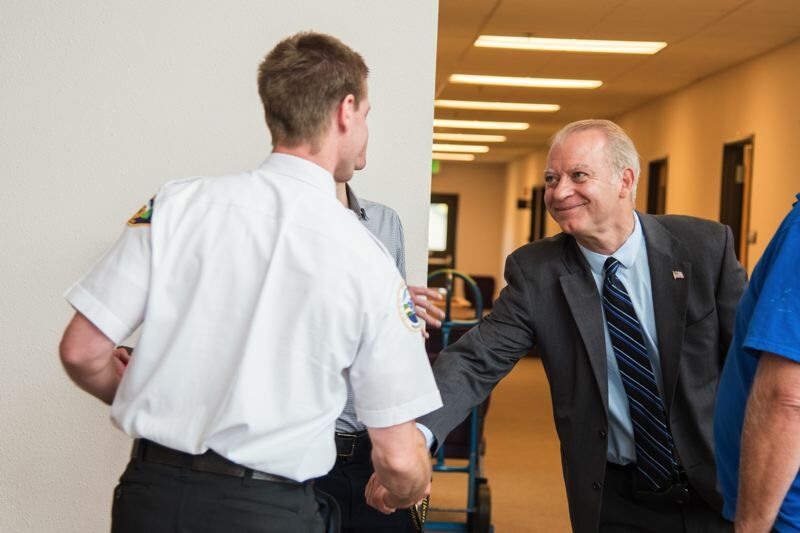 The Red Soils event also recognized Portland Fire Lt. Peter St. John, who made the quick decision to enter the building and pull the alarms prior to a 2016 gas explosion, which resulted in the safe evacuation of everyone. Clackamas County Commissioner Ken Humberston recognized the 19 firefighters who were killed in an Arizona wildfire in 2013, the greatest loss of U.S. firefighters since 9/11. The event began by remembering how on Sept. 11, 2001, more than 2,800 citizens, 343 New York firefighters, 60 New York Police Department and Port Authority police officers, and eight private emergency medical personnel died. Last year, the Red Soils event recognized the military on the fifth anniversary of the Benghazi attack. Next year, law enforcement will be recognized. Retired U.S. Navy Lt. Commander J.J. Morell served as master of ceremonies at the Red Soils Circle of Honor. 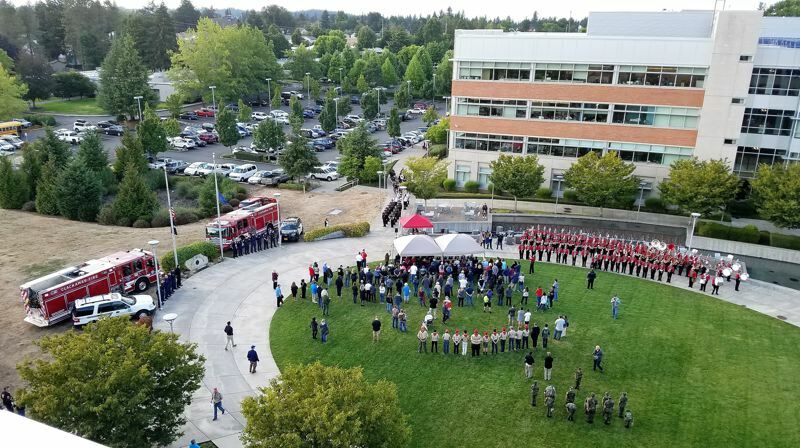 Attending the event with more than 100 members of the public were honor guards from Clackamas Fire, Clackamas County Sheriff's Office, Oregon City High School's JROTC, VFW#1324, Oregon City Police Department and Lake Oswego Police Department. State Rep. Mark Meek and the JORTC led the national anthem at the event. 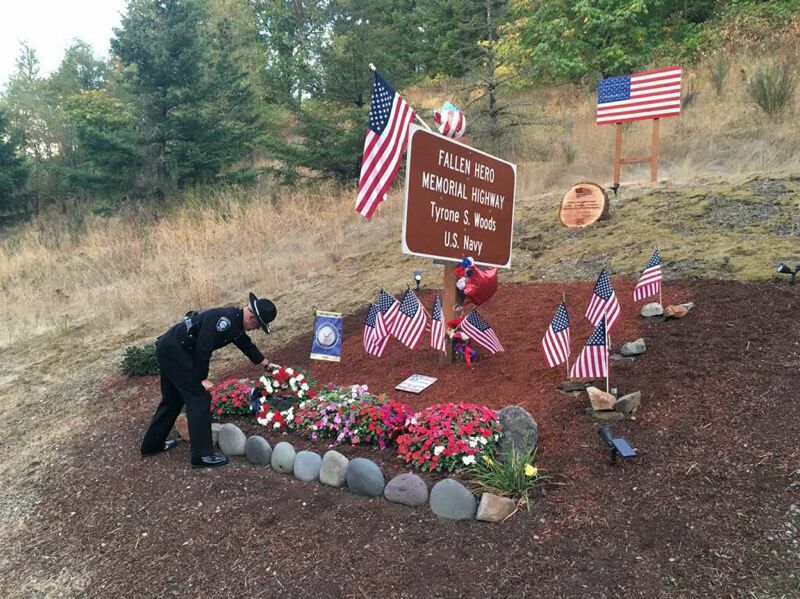 DJ Ruger, a member of the Patriot Day Remembrance event organizing committee and a former commander of the local Veterans of Foreign Wars headquarters in Oregon City, was among those who realized 18 months ago there's nothing for the public in Clackamas County to recognize 9/11. "To have the second-annual [event] come off as well as it did, that means that this event has staying power and will continue well into the future," Ruger said. "Right away after the event everyone comes up to us and starts planning next year's event." 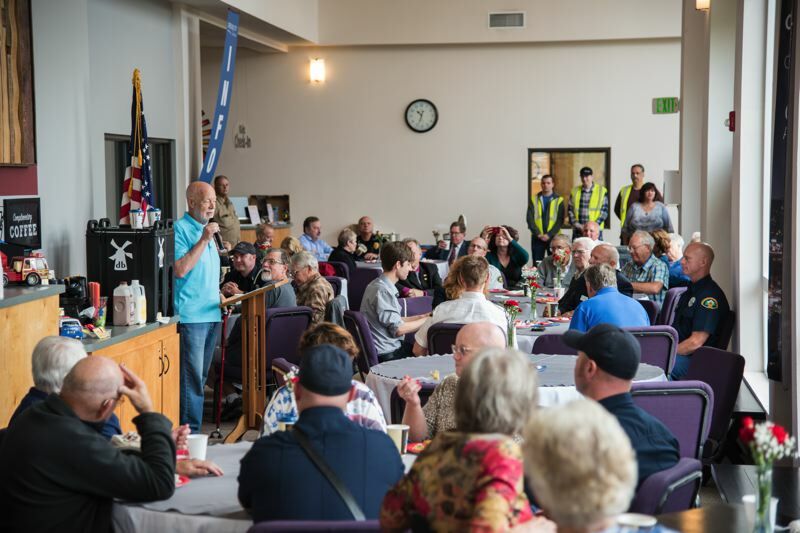 OC Christian Church member Walt Fitch has organized the other annual event in Oregon City to recognize local police officers and firefighters with a free meal. "The whole purpose of being here today is to say thank you … to each and every first responder who is here today, police and fire," Fitch said. Clackamas County commissioners cancelled their regular Tuesday meetings so they could attend the brunch; County Administrator Don Krupp acknowledged that it is "very rare" that commissioners cancel their meetings for an event. None of them were allowed to give speeches, but Fitch read a statement signed by all the county commissioners to thank "everyday heroes" for serving local citizens. "The health, safety and comfort of our community is enhanced by the professionalism, dedication, resourcefulness and integrity of these individuals, agencies and departments," they wrote. "The dedicated professionals who choose this career truly make a difference. … They are true heroes and deserve our recognition today and every day." Rep. Kurt Schrader, who was in Washington, D.C., and couldn't attend the brunch, sent a letter for the occasion, hoping that the positive sentiments and respect for first responders "remain at the surface of everyone's consciousness" not just on Sept. 11. Schrader said it is because of first responders' "tireless work" that we have the luxury of living with our families in comfort and safety. "It is a humbling experience to be in the presence of first responders and to acknowledge the often perilous situations they selflessly throw themselves into without hesitation," Schrader wrote. "The professionalism, compassion and dedication embodied by the individuals honored here today are qualities that deserve our praise and gratitude." Fitch mentioned that "17 years ago on this date, 9/11, not to be confused with the number you call in an emergency, this country was changed by the events that took place on this day." "You see all those people who are running out of the building? They're regular people," Fitch said. "You see all the people running into the building? They are our heroes." After the brunch, everyone was invited to tour the fire engine that had just responded to the false alarm at the local elementary school.